oh goody goody NEW MUSIC! It is with extreeeeeeeeme excitement that I write to you today. Yes I’m still alive! That faint buzzing of wings you’ve heard from time to time? That was me, I have been a busy little bee working on new music (and art) with my beloved band ELLE MACHO (David Mead, Lindsay Jamieson and yours truly). And that is precisely why I am reaching out to you today. This Miniature record is brimming with fun, party pop/rock, moody, witty, sassy Musica. Me and the Macho boys are super excited to share VoVo with you and we hope with all our hearts that you enjoy it as much as we enjoy making it. If you’re new to Elle Macho, welcome to the weird world of Elle Macho! Where we speak in broken english because everybody is welcome. To make this whole project possible I am teaming up, once again, with PledgeMusic to bring you the music and oh so much more! We are in the final stages of having these 5 songs completed and ready to send on out into the world. So close it hurts. 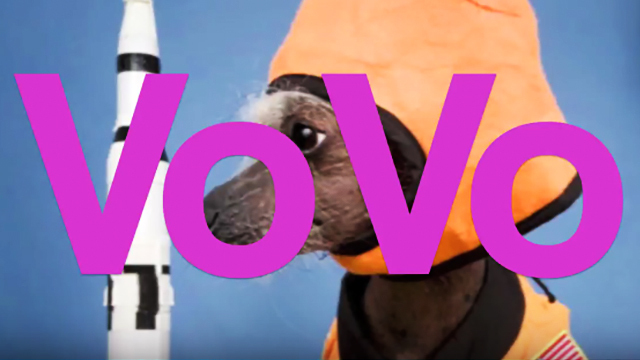 Click on the photo of the astronaut dog below and you will be transported directly to our VoVo PledgeMusic Campaign page, freshly launched just yesterday! Our pledge goal is a modest goal, but we think with enough help we can reach it! In essence we are still just a baby band and still finding our audience, so this campaign is a big part of that journey. Thank you all so much for your time and reading this. I am so unbelievably grateful for your support, be it my solo work or other projects I’ve thrown at you, I hope you know that. Enjoy the music and share away! Previous postNew Single on iTunes Next postTHE LADIDA SONG - & it’s TV debut! Click on the photo of the astronaut dog below and you will be transported directly to our PledgeMusic Campaign for Elle Macho's new miniature record "Vovo!" It Pulls Me Under – Listen Now! © 2012 Butterfly Boucher. All Rights Reserved.